By Jean Halliday and [email protected] . Published on September 28, 2004. DETROIT (AdAge.com) -- Toyota Motor Sales USA has introduced a new direction for its Toyota brand with the tagline "Moving forward." not only in the brand's consumer advertising but will also be integrated into all corporate materials for employees, dealers and even factory workers, said Jim Lentz, group vice president of marketing at Toyota Division. "We feel it's a motivating theme, a rally cry." The slice-of-life TV commercials end with the voice-over "Now that's moving you forward." Toyota also introduces a new logo for all its truck ads, the letter "T" on the head of a bolt emerging from a metal background that is meant to convey strength, durability and ruggedness. Mr. Lentz said it was time for the automaker's advertising to take a new direction as the mindset and demographics of Toyota's customers have changed and as Toyota has a much broader product lineup than five years ago. 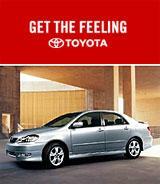 When asked whether the new theme implies Toyota was stalled, Mr. Lentz said Toyota was always viewed as being in motion. "This implies constant improvement. It's really about the DNA of the company." Mr. Lentz said "Moving forward" will appeal to people on a much more emotional level than "Get the Feeling" because it's more about people and less about sheet metal. Wes Brown, an analyst with automotive consultancy Iceology, reacted less than enthusiastically to Toyota's ad plans. "Toyota recognizes the need to be more emotional, which other [auto] brands have been able to capture," he said. The new tagline "doesn't do anything to capture any emotion of owning a Toyota." But Mr. Brown said it makes sense for Toyota to evolve the direction of its brand and unite regional dealer advertising to national executions. The Toyota brand spent $337 million in measured media for the first half of 2004 compared with $309 million a year ago, according to TNS Media Intelligence/CMR. Toyota's ad budget will parallel the brand's vehicle sales so the budget is expected to increase slightly in 2004, Mr. Lentz said. Toyota has been one of the most successful automakers in recent years, enjoying rising vehicle sales as it expanded its product lineup to include trucks and sport utility vehicles. Toyota sold 1.138 million vehicles through August, a 3.3% increase from 1.1 million sold a year ago, according to AdAge sibling Automotive News. Publicis Groupe's Saatchi & Saatchi, Los Angeles, created the latest TV, magazine and newspaper ads to use the new theme. A 60-second brand spot, titled "Wheels," will launch the campaign and air for about a month. The theme will also run in all model-specific executions. "Moving forward" will be expanded to multicultural work as well; Publicis' Burrell Communications, Chicago, has the African-American account, while the Hispanic and Asian accounts are with Torrance, Calif.-based Conill and InterTrend, respectively. Toyota has used a variety of taglines and themes over the years, most notably "Oh, what a feeling," which ran from 1980-86; the ads showed owners jumping for joy about their Toyotas. Mr. Lentz said the tagline still has the most consumer awareness today. Other taglines include: "You asked for it. You got it," from Dancer Fitzgerald Sample (1975-79); "Who could ask for anything more" (1986-1990); and "Toyota. Everyday," which used the Sly and the Family Stones' song "Everyday People" (1997-2001).